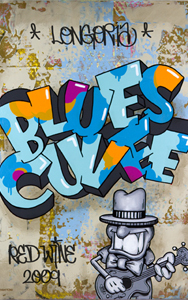 Once again we Trent Call has created artwork for our Blues label. This piece was inspired by Trent's talent for graffiti art. Trent Call was born and raised in Salt Lake City, Utah and graduated from the University of Utah in 2004 with a BFA. His work combines formal academic painting with comics, graffiti and popular culture. Trent’s interests include daily phenomena, odd occurrences, history, myth, color relationship, the early American west, media culture, and 1930’s comics and animation. He frequently works with screen printing, oil painting, latex paint, ballpoint pen, lead, collage and spray paint which allows for a fresh and honest translation of his interests and ideas. He currently paints and draws at CAPTAIN CAPTAIN studios in beautiful downtown Salt Lake City.